The AvantGuard is a futuristic concept for an autonomous unmanned ground vehicle (AUGV) designed for either unmanned or manned operations. The vehicle can perform surveillance and reconnaissance or security missions, patrol routes or detect and neutralize improvised explosive devices (IED). In 2004 , the vehicle was designated the Avidor, which stood for "autonomous vehicle in deserts and on roads." 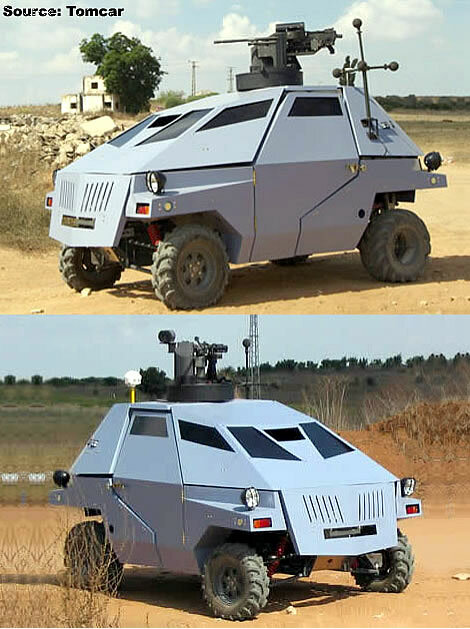 The AvantGuard is based on the Tomcar model TM27GL all-terrain vehicle (ATV) currently used by the Israel Defense Forces and Israeli border police. The autonomous vehicle configuration utilizes robotics and sensor technologies, allowing the UGV to think its way around obstacles and communicate w ith the operator or other vehicles. The vehicle uses a sensor package that can identify and avoid obstacles along a pre-planned route. The navigation system uses a differential GPS (DGPS) system with three levels of control. Other sensors include front and rear cameras mounted on a 360-degree omni- directional pedestal. Depending on the mission profile, its payload can include electro-optical, communication relay, jamming and weapon stations. One payload could include the Elbit Systems remote-controlled 7.62-mm weapons station.